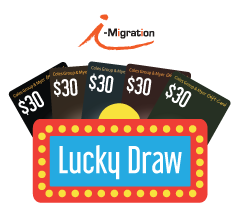 WIN 1 OF 10 $30 AUD COLES AND MYER GIFT CARDS ON THE DAY! Prizes will be draw at the end of the seminar plus all attendees will receive a goodie bag. Venue: DMC-C121 | Undercroft LT (Bundoora Campus La Trobe University). Register your details to enter in the draw. You are successfully registered for the Migration Seminar.